A law firm owned by the sister of Democratic Rep. William Lacy Clay Jr. (Mo.) was the recipient of more than half of his campaign's expenditures during the first quarter, according to new filings to the Federal Election Commission. Clay raised $145,340 throughout the first quarter of 2019, which spans from Jan. 1 to March 31, and disbursed $56,797 during this time. Clay's sister's firm was the biggest recipient of the campaign's cash. According to the filings, $30,000 was paid out from the campaign's coffers to the Law Office of Michelle C. Clay LLC, a company owned by Clay's sister, Michelle, during the first three months of the year. The address listed for the firm in Clay's filings is marked in Silver Spring, Md., just a 20-minute drive outside of Washington, D.C, and also appears to be a residential home and not an office. The firm does not appear to have a website and practically no information is available online in relation to its operations. However, the Law Office of Michelle C. Clay LLC is incorporated in Maryland and is currently active, a search of business entities in the state shows. The firm was disbursed three payments in the amount of $10,000 each, which were made in early and late January, with the third payment disbursed in late February. Clay's sister received the cash for what is marked as fundraising, compliance, and community organizing. Clay paid his sister's firm for fundraising despite the committee receiving very little money from individual contributors while an overwhelming majority of its cash came from donations from committees. Clay also paid out $9,000 to Frailoi & Associates, a D.C.-based campaign consulting group, for fundraising, the filings show. It is also unclear what community organizing the law office is receiving compensation for, as community organizing is typically not an activity performed by law offices. The office is also located 12 hours away from St. Louis, where Clay's district is located. 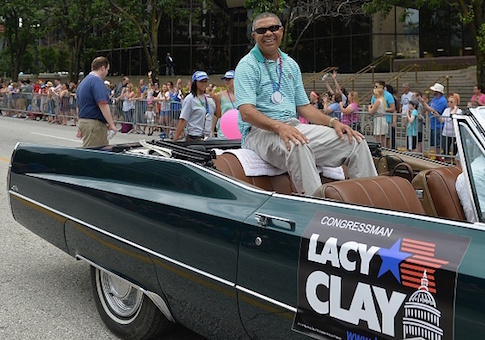 Clay's campaign did not return a request for comment on what type of fundraising and community organizing work his sister's firm is performing on behalf of his campaign. Outside of the money Clay's campaign disbursed to his sister's firm and Fraioli & Associates, the representative charged thousands on an American Express card for travel, spent thousands more for catering and "meals while working" at the National Democratic Club, and more than $1,000 on "Ford Credit" on an automobile. This is not the first time the law office has received money from Clay's campaign committee. The Democratic congressman put his sister's firm on his campaign's payroll about a year after entering Congress in 2002. Since that time, the Law Office of Michelle C. Clay has been paid more than $950,000 from his campaign's funds.